On July 4th I was walking on the top floor of a local casino parking garage to get a panoramic view of the city’s fireworks displays. I noticed a strange pain in my left foot but kept walking. The pain intensified and by evening I was wrapped in a blanket with chills from the intense pain (it was 105 outside). The next day I could barely walk and by the third day I could put no weight on the foot. Reluctantly I went to the local Quick Care for treatment but multiple x-rays revealed no injury. When offered pain medication I declined, thinking I could just live with it if it didn’t get any worse. It got worse. A couple days later I was back at the quick care begging for drugs. It’s amazing what strong narcotics can do for pain relief. The pain had become so severe I could not think-I could barely communicate-I could not function normally-it was crippling! Upon administering treatment I was back to some level of sanity and could focus on something other than the pain. We live in a world full of hurting people. Their pain may not be obvious but the hurt is no less severe. We encounter them everywhere we go unaware-unaware because we seldom take the time to notice. The pain they endure may be from a broken relationship with a mate or close family member. They may be that teenager who just can’t seem to measure up to their parents’ expectations. Some suffer the pain of acute loneliness that could be relieved with a simple conversation or visit. Some carry the burden of failed marriages or businesses. Psychologists agree that a man responds to a failed business much the same as he would to the loss of a loved one. I know that to be true. The wife who gives her all to her husband and kids but never receives appreciation or affection from them walks in silent pain. The incarcerated serving time in a lonely cell for one bad and costly decision or act suffers a pain we can’t comprehend. The young girl who thought aborting or giving up her child was the right decision may now be carrying the pain of guilt and regret. The man who lost his family over indiscretions and now sees another care for what was once his suffers a dull pain that may never go away. These are the pains that left untreated can cause one not to think clearly-not to be able to communicate-to not be able to function normally-the unseen pains that are crippling. How I wish I had the time-the capacity-the reach to embrace these who suffer silently. We all know how our hearts ache when our kids or grandkids cry. We don’t need to know why the tears-we just want to hold them until they stop flowing. How much more does our Savior react to our pain. How cool is it that we have someone to call out to who lived the human experience in the Earth He created so as to empathize with our hurts and our feelings. Psalm 34 tells us that the Lord is always near to those with broken hearts and crushed spirits. Sometimes in the midst of our pain we can’t see or accept the relief that comes from calling out to God for mercy, so we go on through life thinking like I did, that we can live with the pain if it doesn’t get worse. There are no quick fixes to deep emotional stress carried unseen by so many. However that is no excuse to not be engaged or aware of those around us who may be hurting. It is surprising how many of these people worship with us each week in our churches! I am always on someone’s schedule, running here or there, but I am trying to remember to ask God to help me see others who need a word, a hug or a meal. If you know of individuals who suffer in silence, get involved, go out of the way, send a card, make a phone call, buy them coffee-whatever it requires to just be a presence at a lonely time. We don’t need answers-we don’t need to bombard them with Bible verses. We just need to let them know we are aware of their hurts so some healing process can begin. It’s not about deeds and works and righteousness-it’s about love, about caring, about sharing the burden of pain that is too great or someone to carry alone. Father, help us see the pains in others that you see and respond as you would with love, with empathy and with presence. 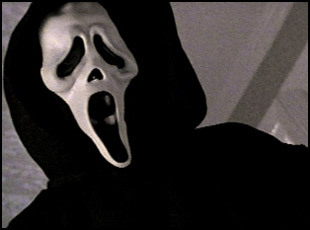 Is Your Life a Scary Movie? I have always been a fan of scary movies. I don’t go for the blood and guts genres as much as the drama and suspense. I prefer the Classics like Frankenstein, Dracula, and particularly the not-so-funny spoofs like Young Frankenstein where the monster dons a top hat and sings Puttin’ on the Ritz, ala Broadway. I’m amazed with the more modern horror flicks at how many times a monster can be killed off only to be resurrected for a sequel or two or ten. How many ways can Michael Myers be terminated before he stays dead? Just when you think the boogey man is gone, he re-emerges back into your life unexpectedly to haunt and terrorize you some more. Every time he comes back to life we entertain him some more, almost as if we have been waiting in anticipation for his return. For many of us our lives resemble a scary movie, haunted by events and decisions in the past that just won’t die. We are constantly haunted by regrets, by failures, by skeletons in our closets that emerge just when we think the coast is clear. For believers in Christ who have been forgiven their sins, the enemy likes to bring them back from the dead into our memory bank like a shadow we can’t lose or the fog we can’t find our way out of. Could we have saved our marriage? Could I have done more to save a business? Have I really been forgiven of stupid decisions in my past? How can God, who knows everything from the beginning to the end really forget my sins? Instead of living in peace with the assurance of eternal forgiveness we find ourselves like the victim of a scary movie, running for our lives from monsters who just don’t seem to ever die, and we entertain them as if we were expecting them to come back. 2 Corinthians 5:17-If any man be in Christ, he has become a new creature. All things in his past have gone away and everything has become new. Isaiah 43:25-I am he who blots out your sins for my sake and remembers them no more. Romans 8:1-There is now no condemnation to those who are now in Christ. Psalm 103:12-As far as the East is from the West he has removed our sins from us. Hebrews 8:12-I will purge them of all evil, and I will not remember their sins again. I will be merciful to their iniquities and their sins I will remember no more. If we are truly in Christ and beneficiaries of his promises, then there is no reason to give in to the constant reminders by the enemy of where we were and what we did. “I Still Remember What You Did Last Summer” is the name of a fictional scary movie, not the theme of a believer whose sins are covered and buried under grace and forgiveness. It may be impossible for us to completely blot from memory our past, but it is possible through the daily renewing of our minds to change the scary movie channel and find a different station. Leave the ghost stories for sleepovers and camp fires!